Lesson Description:In this lesson student will utilize the information gained through their individual research on a chosen issue to create an original artwork. Evaluate media for its applicability to the creation of an original commentary artwork. Work together with the teacher to develop a grading rubric for their artwork. Utilize their research as background information in the creation of their artwork. 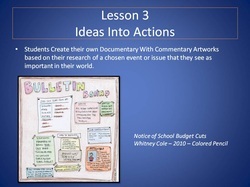 Demonstrate their understanding of a chosen social issue, chosen media and techniques related to that media, in the creation of an original artwork. • The student and teacher will conference to determine the best media to effectively communicate the student's desired message in their commentary artwork. • The student will create preliminary sketched in their sketchbook as a means for developing their artwork. Materials will vary according to student choices. Formative assessments will be used throughout the studio periods to evaluate student on task time, use of materials and media techniques. The teacher will conference often with individual students to monitor their progress on individual projects. Summative assessment will be used for the final artwork in accordance to the rubric created by teacher and student as a team. • AIV.4 The student will select and use appropriate technology and electronic media for personal expressive works of art. • AIV.5 The student will demonstrate confidence, sensitivity, and advanced skill in applying media, techniques, processes, and craftsmanship to achieve desired intentions in works of art. • AIV.6 The student will select among a range of subject matter, symbols, meaningful images, and media to communicate personal expression. • AIV.7 The student will use experimental techniques to reflect a personal, creative, and original problem-solving approach. • AIV.8 The student will demonstrate personal responsibility and integrity in ethical matters and procedures, including adherence to copyright laws, when producing works of art.